These two words are very often confused by English students because they are similar in meaning; however, they are used differently. We use "more" to mean that we want extra of the same thing. Add more water if the mixture is dry. 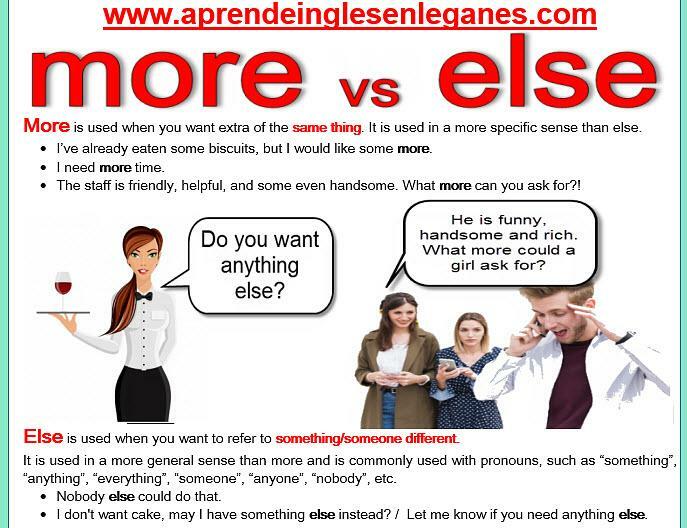 We use "else" when we want to refer to something or someone different. If there is something else you need to know, email us or ask us on Facebook. John, Mike, Susan and Kate are coming to my birthday party. Is anyone else coming ? In the picture below, you will find some more examples that will help you to better understand how to use these two words.